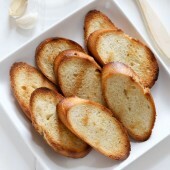 Grilled French bread slices brushed with a garlic and oil mixture. Slice bread diagonally into 1/2-inch pieces. In a small bowl, combine remaining ingredients. Microwave for 30 seconds or until fragrant. Brush both sides of each slice with garlic oil. Grill over low heat for 2-4 minutes per side or until golden and crisp, with some grill marks.